We hope you have found at least some (and we hope lots) of useful new data during your whirlwind tour of the Van Buren IA county IAGenWeb site. The mission of the GenWeb project is to offer as much free information online as we can to help you in your research even though you may not be able to visit our area in person. We've been told that the Van Buren county site is one of the more helpful ones out there in this respect. But, we want to keep the site growing in usefulness so researchers will have a reason to come back. We always seem to have more information available to put on the web site than we have hands to do it. So this page is devoted to our "Help Wanted" department. The work is not difficult, but it takes time. The pay is excellent! No, not in dollars but in the gratitude of those who you help find their long lost ancestors that they may never have found without your help. The information we are transcribing and putting online today will likely be serving researchers long after we are out of the picture. Would you enjoy being a part of this? Do I see a couple of hands raised? Below are just a few of the projects we are needing some help on right now. Some are specific to Van Buren county IA, some are more of a state-wide nature that we are directly involved in. This list will be updated periodically so check back often. And thanks in advance for any help you can offer. If you have materials to donate or if you would like to help transcribe on a specific project listed, please let me hear from you with the specifics. 1930 Census - Volunteers are needed to transcribe the 1930 Federal Census for Van Buren county. You may select one or more townships or towns of your choice to transcribe. Transcription needs to be carefully proofread upon completion. You may volunteer to transcribe or to proofread, or both. Spreadsheet template will be supplied. Source Material: Images of Census pages. Miscellaneous Obituaries - Assorted obituaries donated by various parties. Volunteer would first check to see if already on Obituary Message Boards and if not would post obituary. [Volunteer Paul French has transcribed many obits. John Chapman has also offered his services. This will always be a category in need of help.] 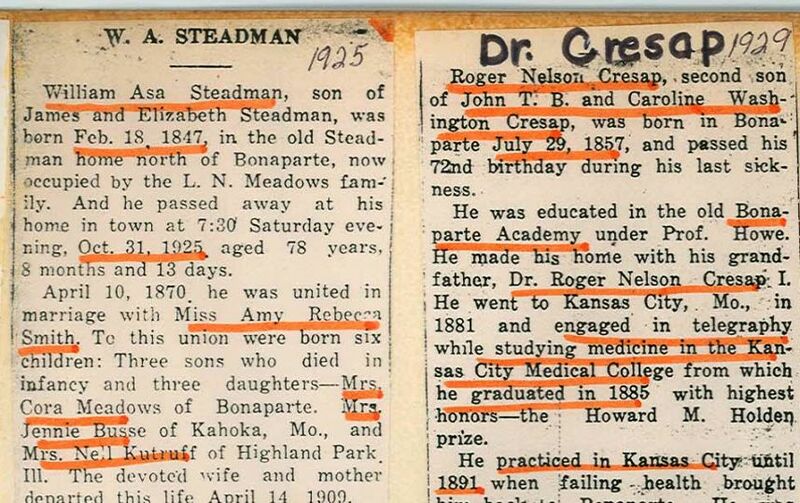 Source Material: Photo copies or digital images of newspaper obits. Software Needed: It is best to transcribe into a Word document first then transfer to online form. 1925 Iowa Census - - Volunteers are needed to transcribe the 1925 Iowa Census for Van Buren county. You may select one or more townships or towns of your choice to transcribe. Transcription needs to be carefully proofread upon completion. You may volunteer to transcribe or to proofread, or both. Spreadsheet template and images will be supplied. Source Material: Images of pages supplied.